Last year these flowers were a great comfort to me. This year they are a reminder of God’s goodness and faithfulness. I snapped the above picture on the one-year anniversary of a discouraging and difficult doctor’s appointment. The previous year I walked through my yard the evening following the visit and saw these flowers. 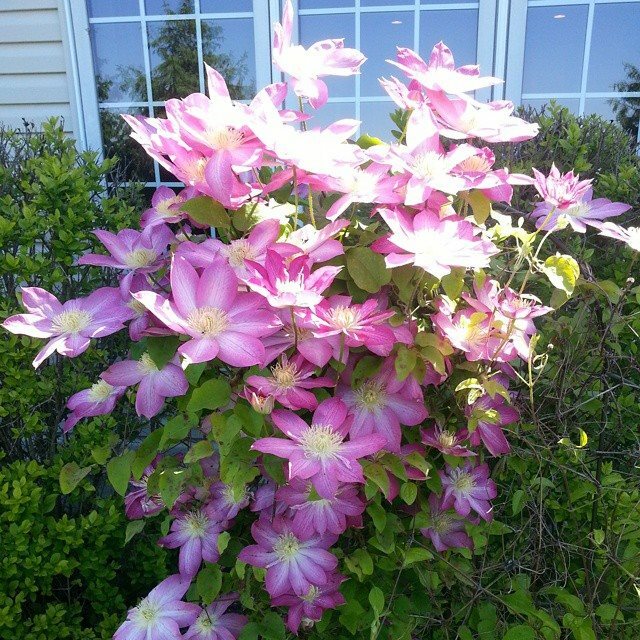 The pink and white clematis quickly caught my eye and a wave of comfort washed over me. What comforted me WAS NOT the naïve or Pollyannaish belief that if God could make these pretty flowers in my garden then He would fix me and the baby and make us all better. While it’s true that He could, God doesn’t always choose to work that way. In fact, Lamentations 3 and Hebrews 12 speak of God allowing His people to walk through hard times, not to mention the examples we have in Scripture -- Sarah, Joseph, Ruth, Elijah, and Daniel to name a few. Even if you and I are not presently dealing with hardship, we know people who are. Marriages have problems, parents get sick, children have issues, jobs have difficulties and relationships are strained. These are not hypothetical or out-there situations. In fact, they all exist within my close circle. I also wasn’t operating under the impression that going through this would be super fun if only I was spiritual enough about it. While Scripture tells us to be joyful in all things, it doesn’t say that everything’s a joy. I’m pretty sure that all things being equal, Paul would rather the ship had not run aground. Christ asked if the cup could be taken from Him. And me? Like any other sane woman I’d rather have a typical delivery with sips of Sprite in between contractions and a healthy full-term baby at the end. So, why did seeing those flowers comfort me and bring me peace? They reminded me that the same God who created the universe is intimately acquainted with me and working things for my good. He doesn’t lack vision, run out of supplies, or lose interest in us. He is always, absolutely, and abundantly working for our good. I knew there was no way I was going to understand all of that in this situation. At least not on this side of heaven. Instead, I decided my job was to trust in that knowledge and look for its outworking in my circumstance. I was in the thick of it but I wasn’t alone or lost. I was where I was supposed to be and God was right beside me. In my life, God rewarded this step of faith quickly through the response of my children. The more I looked for God’s goodness in my life the more I saw it. He used His body to care for my family’s needs in a variety of ways. Most remarkably, I experienced peace and joy as I waited to see what would come to pass. That could have only come from Him. During this time a good friend urged me to write down one thing a day I was thankful for. Whenever my mind began to wander in fear or worry, I was able to whip that list out and remind myself that God was working and that He was faithful. So...what happened? Well, not much and a whole lot. My baby ended up being quite healthy and incredibly feisty. On my end, the most serious complication was completely mitigated. When one of the many medical students lining the walls of the operating room shouted, “What happened?” my doctor shouted back, “I’ve been praying, she’s been praying, her church and friends have been praying. God worked here.” I praise God for her response. A year later, as I reflect on my son’s birth, I am amazed at the unexpected, merciful and overwhelming way that God worked in the operating room. However, I am most blessed and encouraged by how He sustained me in the months preceding that day. Our God is always faithful. He can’t not be. If you are going through a hard time I encourage you to look for His faithfulness and goodness to you. The challenge you’re dealing with may very well continue but I trust that in the midst of it He will bless you with the same comfort, peace and joy that He gave to me.